The high quality standard poses a constant challenge for all colleagues in our company and is also an obligation to our customers. 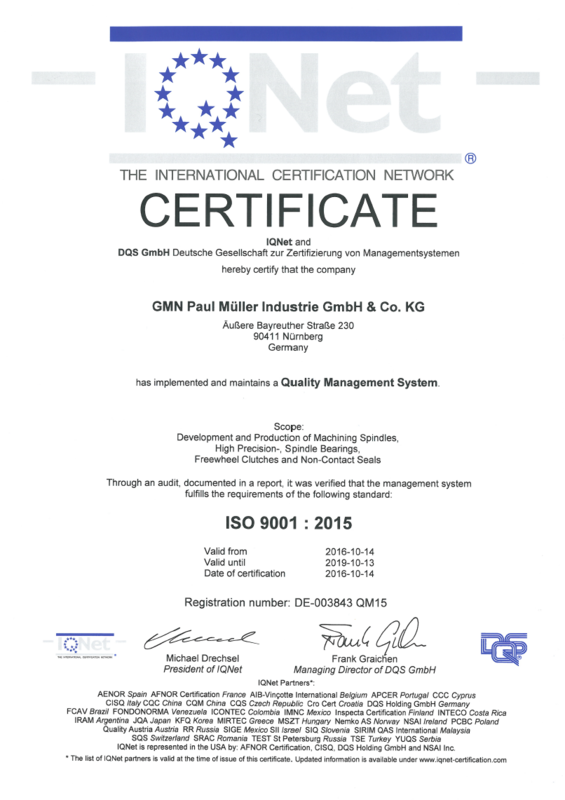 The management of GMN Paul Müller Industrie GmbH & Co. KG therefore places great importance on promoting awareness for responsibility and quality among its employees with regular training. 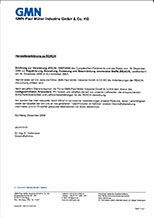 The appraisal of GMN Paul Müller Industrie GmbH & Co. KG by the DQS in the ball bearing, motion-technology (freewheel clutches and non-contact seals) and spindle technology divisions was completed successfully in November 2004. Therefore the company got certificated following the DIN EN ISO 9001:2015. The quality policy of GMN Paul Müller Industrie GmbH & Co. KG, is based on the principle to offer the best possible solutions to all demands of our customers and to get and keep the confidence and satisfaction of our customers. The target of delivering perfect products to our customers includes a careful handling of all related treatments and services. The company satisfies the requirements to be state of the art referring products, treatments and services. 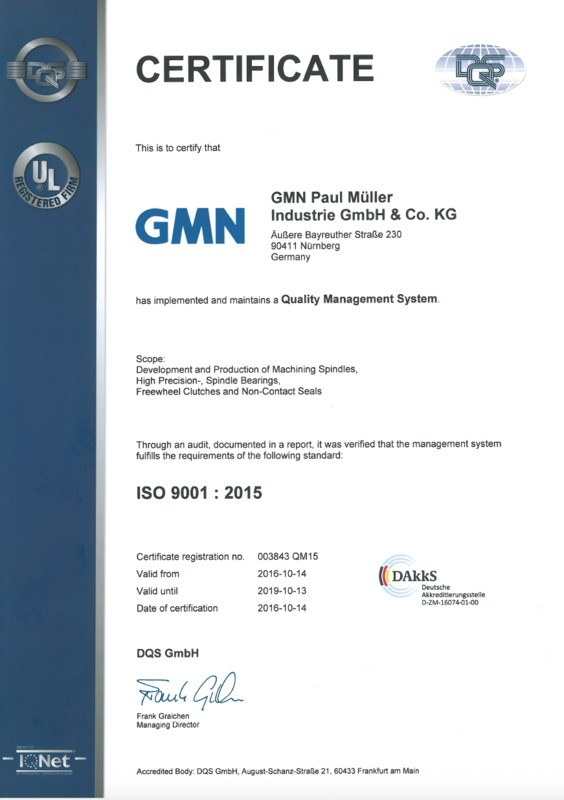 The GMN Paul Müller Industrie GmbH & Co. KG has been certified by the DQS according to DIN EN ISO 9001. A certificate confirms that organisation and procedures within our company have been established in accordance with DIN EN ISO 9001 and have been documented in a comprehensible manner. We have no plans to develop a separate management system for environmental protection in accordance with DIN EN ISO 14001 in addition to the quality system. 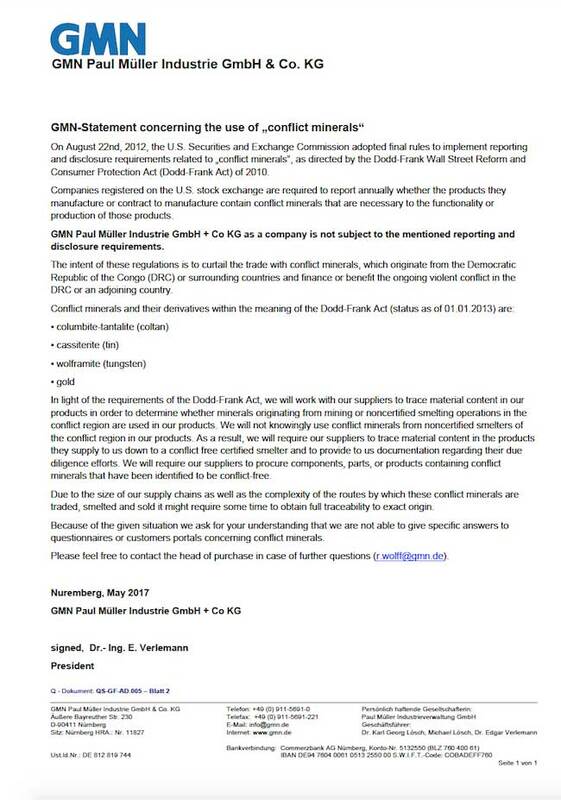 Nonetheless, GMN Paul Müller Industrie GmbH & Co. KG undertakes to implement and adhere to environmental protection measures within the company. 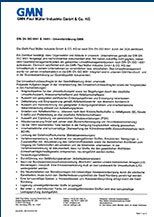 The included pdf-file describes our environment proctection management. The included pdf-file describes our environment protection management RoHs. The included pdf-file describes the environment protection management REACH. 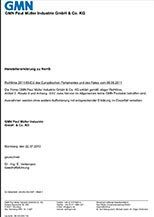 The included pdf-file describes the statement concerning the use of „conflict minerals“.